This article is about a South Korean city. For the body of water called such by South Korea, see Sea of Japan. Donghae (Korean pronunciation: [toŋ.ɦɛ̝]) is a city in Gangwon Province, South Korea. There are two major ports: Donghae Harbor and Mukho Harbor. The city is located on the Yeongdong Line railroad and the Donghae Expressway. Numerous caverns are found in the city, as in neighboring Samcheok. Hanzhong University is located here. Donghae City is located in the central region of the east coast of Korea in Gangwon-do. 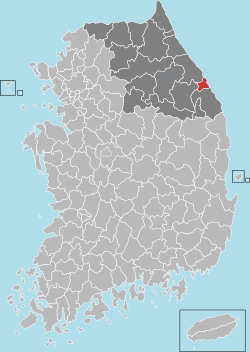 Jeongseon county to the west and Gangneung city to the north. It contains the southern terminus of the Donghae Expressway, and the No. 7 national way passes through the city. The city is mostly mountainous and has natural resources such as Mureung Valley and beautiful beaches. 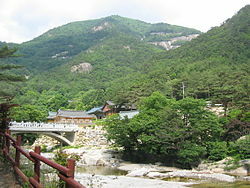 Here, the high Taebaek Mountains lie along the eastern coast, preventing rivers from meeting the coast. However, in the rainy season, spontaneous water flow is possible. Donghae area and its neighborhood are a free industry zone. From this, Gangwon province and Donghae city has overtaken team for investment. A cruise ferry line connecting Russia, South Korea and Japan opened in the summer of 2008. DBS Ferry currently transits between Donghae, Sakaiminato, Tottori and Vladivostok. ^ 평년값자료(1981–2010), 동해(106) (in Korean). Korea Meteorological Administration. Retrieved 8 December 2016. ^ 기후자료 극값(최대값) 전체년도 일최고기온 (℃) 최고순위, 동해(106) (in Korean). Korea Meteorological Administration. Retrieved 8 December 2016. ^ 기후자료 극값(최대값) 전체년도 일최저기온 (℃) 최고순위, 동해(106) (in Korean). Korea Meteorological Administration. Retrieved 8 December 2016. ^ "Climatological Normals of Korea" (PDF). Korea Meteorological Administration. 2011. p. 499 and 649. Archived from the original (PDF) on 7 December 2016. Retrieved 7 December 2016. ^ 국제 자매(우호)도시 결연 현황 (in Korean). Donghae Culture Center. Retrieved 14 January 2017. Wikimedia Commons has media related to Donghae.